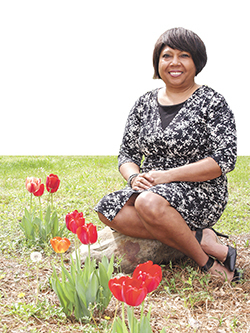 Patricia Neely-Dorsey, pictured at the Lee County Library in Tupelo, is the author of two books of poems. Her words convey her personal history and observations, but her choice of topics reflects the shared experiences of all Mississippians. Patricia Neely-Dorsey doesn’t cotton to people saying bad things about Mississippi, and she’s on a personal crusade to stop it. It started when, as a student at Boston University, she realized the only things her northern friends knew about Mississippi were misconceptions and stereotypes. Since then she has taken it upon herself to talk up Mississippi at every opportunity—and to share her passionate sentiments in the poetry she writes. Her poems express “the little things that make Mississippi so special, and the values of the people and the family connections and ties,” said Neely-Dorsey, a member of Tombigbee Electric Power Association. She has published two collections of original poems and is working on a third. She also leads creative poetry workshops and speaks to students and adults of all ages about writing poetry. Her poem “Meet My Mississippi” will be considered during the 2016 legislative session to become the state’s official poem. Neely-Dorsey’s skillful word play stems from her upbringing in Lee County, just north of Tupelo. Her father, Dr. James H. Neely, was a country doctor with an office in Tupelo; her mother, Elaine Kilgore Neely, was a teacher. Her dad’s dramatic recitations prompted eye-rolling from mom but instilled in young “Patty Cake” a love of (and ear for) the poetic voice. “When Malindy Sings,” a poem by the late-19th century poet Paul Laurence Dunbar, was a favorite shared by the two. Dunbar was the first nationally known African-American poet. “The type of poetry I write is very rhythmic, very hip-hoppy, and it came from loving the kind of poems Paul Laurence Dunbar wrote,” Neely-Dorsey said. Her mother strongly encouraged reading by taking her children on frequent trips to A.M. Strange Library, the only Lee County library serving African Americans during segregation. The library was housed in a one-room building that still stands on North Green Street in Tupelo. Each time we stepped in the door. Although an avid reader, she didn’t write until her 12th grade AP English teacher required the class to write every day in a personal journal. “[Journal writing] tells you what your mind is focused on that day and what stands out to you in life. It was a gift that she made us do that,” Neely-Dorsey said. After earning a degree in psychology from Boston University and working 20 years in the mental health field in Memphis, she and her husband, James, moved to Tupelo in 2007. She wanted their son, James Henry, now 16, to grow up in Mississippi. Something else changed her life earlier that year. On Feb. 14, 2007, Neely-Dorsey began composing poetry for the first time in her life. “I just woke up out of my sleep with poems swirling around in my head,” she said. A place that none can tell. “After that, the poems just started to flow and flow,” almost faster than she could write them on receipts, bills or whatever paper was handy. Two months later, she showed her parents a thick folder stuffed with some 300 poems she had written. She never thought of publishing them until John Campbell, a life-long friend and author, encouraged her to consider it. 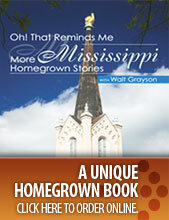 The result is two books: “Reflections of a Mississippi Magnolia” (2008) and “My Magnolia Memories and Musings” (2012). Her third collection of poems, “Mississippi in Me,” will be released in early 2016. Her poems are relevant to every Mississippi who has eaten homemade ice cream, ridden in a truck, shared gossip, attended church, spent a fall day in the country, admired a bottle tree, driven the backroads home or fallen in love. Several Tupelo landmarks, past and present, make an appearance in her work: Reed’s Department Store, The Corner Shoe Store, Carver School, Vaughn’s Motel, the Natchez Trace and Debro’s, among others. Her depictions of Mississippi have reached readers around the globe via social media. Southerners living outside the South are some of her biggest fans. “This is the stuff I’ve been trying to tell all my friends and I didn’t know how,” one of them told her. “Besides having my child, that was the high point of my life, hearing them read that on the House floor in that magnificent setting,” she said. After reading poems before House members, she met with Gov. Phil Bryant, who proclaimed her a Goodwill Ambassador for the state. “We sat and chatted about how everyone bashes Mississippi and how no one wants to tell the flip side of the coin. “I am so passionate about promoting the positives in Mississippi. I just want to be able to protect and promote our cultural heritage. “So that’s me. I’m the flag waver,” she said. Books by Patricia Neely-Dorsey are available in independent bookstores and from the author. Contact her at 901-848-6800, magnoliagirl21@yahoo.com, Facebook or patricianeelydorsey.webs.com. At her speaking engagements, Patricia Neely-Dorsey encounters people who write poems but may lack the confidence to share them. • Stop hiding your poems. No one knew that the reclusive Emily Dickinson had written more than a few poems until after her death, when some 1,800 were found. • Use different ways to get your work out there, such as social media, a blog, printed cards and bookmarks, newsletters and even the church bulletin. • Make it personal. Your stories are yours alone, but many others will relate to them. • Don’t be afraid of negative responses. Develop a thick skin and believe in yourself, your message and your story. There is an audience for it; you just have to find it. • Write every day in a journal—prose, not poetry. Journal writing keeps you observant and helps you organize thoughts and words. • Make notes on things you see, hear and think during the course of the day. • Make a space to write. Neely-Dorsey prefers a quiet “think tank” of solitude. She turns her focus inward and listens only to her own thoughts.